It is coated with high quality Germany Greblon nonstick coating from inside and with HTR (High Temperature Resistance) from outside. It is rust free thus does not let the product to rust. High standard stainless steel lid. Vitreous Cookwares are made from heavy gauge mild steel, which are coated with vitreous enamel. It is dressed up by baking with beautiful floral and linear designs. Select your Diwali gifting, from a range of unique and new products @ Kaledio. These beautiful bowl set, is sure to win many hearts. Backed by expert and experienced professionals, we provide Kitchen Appliances. Beige is the new Green ! Earthens is driven to making our world greener and making it safe for our children for many generations to come. Earthens foodware are environment-friendly and are designed for contemporary use. This is the best HALDIRAM'S Sweet's..
We are offering Kitchen Gift Items to our customers. Our range of products is therefore, procured from well renowned and certified vendors across the globe. This is a best gift set for induction stoves. 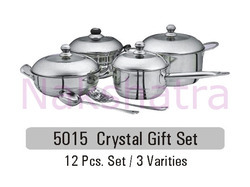 This gift set contains a imported roti or dosa tawa , s. S. Fry pan, s. S milkpan, s. S. Kadai, s. S. Donga. Suitable for all kinds of induction cookers and lpg stoves. Price:600 rs per set.